Congress thwarts Obama’s goal to transfer Guantanamo prisoners to U.S. soil. Congress Just Thwarted Obama’s Ability to Transfer Gitmo Prisoners to U.S. Soil. Again. President Obama has been trying to close the controversial prison since he took office in 2009. 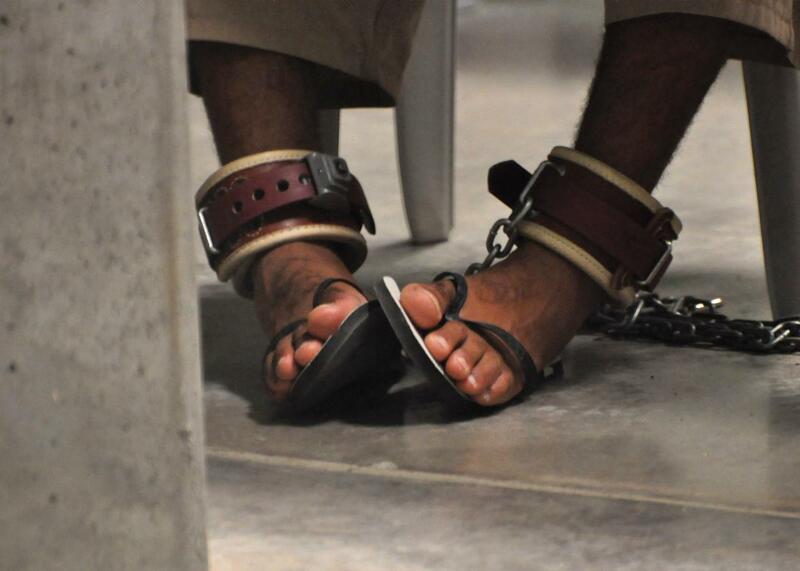 Here, a Guantánamo detainee’s feet are shackled to the floor in 2009. It just isn’t President Obama’s week. First, he was blocked yet again by an appeals court from enacting his immigration overhaul on Monday. Now, Congress has given final approval to a bill that would (among other things) likely prevent the president from finally moving Guantánamo Bay prisoners to U.S. soil in his final year in office. Congress on Tuesday approved the $607 billion defense bill, with the Senate voting to pass the funding measure 91–3, following a 370–58 vote in the House last week. This approval makes it increasingly unlikely that Obama will be able to fulfill his 2008 campaign promise to shut down the controversial Cuba detention center. Obama vetoed a similar defense bill last month, and even emphasized the point “by publicly signing the veto statement before a pool of White House press,” according to the Washington Post. However, he hasn’t threatened to veto this one and probably won’t; the numbers suggest that Congress would easily be able to override a veto, which would be pretty embarrassing. (Substantial Democratic opposition to the previous bill meant he knew that there weren’t enough votes in the House to overturn his veto.) Instead, it looks like Obama will probably be forced to sign the act, as Joshua Keating reported last month in Slate. Another reason he will likely sign the bill is that it includes other key provisions “that are important to running and protecting the country,” said White House press secretary Josh Earnest. Besides the ban on transferring prisoners, the bill will also allow for a 1.3 percent pay increase to service members, give legal assistance to Ukraine forces fighting Russian-backed rebels, extend a ban on torture to the CIA, and authorize the president’s request of $715 million to help Iraqi forces fight Islamic State militants. But the Guantánamo fight could actually continue. Obama’s next move may be executive action, which could lead to another court battle like the one holding up his immigration executive action. “Administration officials have been increasingly candid that it is a route the president is willing to take,” the Wall Street Journal reported last week. “I certainly wouldn’t, as I mentioned last week, take that option off the table,” Earnest told news outlets last week. In order to effectively shut down the military prison, the administration would also need to identify receptive domestic prisons to hold the prisoners. The Department of Defense has been looking into possibilities for a while. “A Pentagon report expected as early as this week identifies prisons in Colorado, Kansas and South Carolina where Guantanamo detainees could possibly be housed,” reported the AP. But lawmakers in those states have taken a decidedly NIMBY approach to this idea. The military prison held 112 detainees as of the end of last month, down from 240 when Obama took office, according to the Wall Street Journal. The majority are from Yemen, where an ongoing civil war has complicated American efforts to send them home. At least 52 of the remaining prisoners had been approved for transfer to other countries while Obama had planned to move the rest to American prisons. However, the bill also imposes limits on international transfers.